The Bihar Deputy CM said the RJD chief had met with Union minister Arun Jaitley and made the offer in return for leniency in fodder scam cases against him. 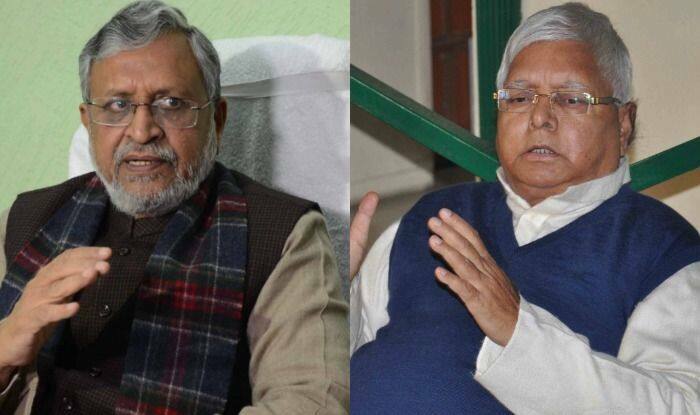 Bihar Deputy Chief Minister Sushil Kumar Modi alleged on Wednesday that RJD chief Lalu Prasad had met Union minister Arun Jaitley with the offer to help bring down the grand alliance government and install a saffron party dispensation if fodder scam cases against him were watered down. Addressing a press conference, Modi claimed Finance Minister Jaitley, however, snubbed Prasad, who approached him through his emissary– former Union minister Prem Chand Gupta– and also met him in person. Slamming Prasad for “always spewing venom against the BJP-RSS combine but never shying away from seeking our help whenever it serves his purpose”, the BJP leader said Jaitley curtly told them that the CBI is an autonomous agency in whose functioning the government does not interfere. Prasad’s son and Leader of the Opposition in the state assembly Tejashwi Yadav rejected the allegation, and said it reflected the BJP’s worry of an impending electoral defeat. “His allegations that we sought help from the BJP at any point of time show his mental bankruptcy and worry of an impending defeat in the elections. The entire country knows that it was Lalu who had stopped (LK) Advanis Ayodhya Rath Yatra and has always valiantly fought their communal agenda,” he tweeted. After their dismal performance in the 2014 Lok Sabha elections when a Narendra Modi wave swept the country, Nitish Kumar’s JD(U), RJD and the Congress had formed a grand alliance and stopped the BJP’s juggernaut in Bihar in the 2015 assembly polls. The three-party alliance was in power till July 2017 when Kumar returned to the NDA following sharp differences with the RJD over allegations of corruption against Tejashwi, who was then the deputy chief minister. Sushil Modi said the Jharkhand High Court had passed an order in 2014 granting Prasad some relief. The court ordered that separate trials will not be held in the six fodder scam cases against him. “Separate trials meant more trouble for the RJD supremo and, hence, he sent his emissary Prem Chand Gupta to Jaitley with his offer in exchange for the CBI either not appealing against the High Court order or weakening its arguments before the apex court once the appeal was filed,” Modi claimed. Gupta, he claimed, met Jaitley three to four times, and when Prasad realised that the negotiations were “bearing no fruit”, he himself called on the Union finance minister. “Jaitley declined. It has always been the BJPs line never to help those accused of corruption,” Modi said. On one hand, Prasad was having an alliance with Nitish Kumar’s JD(U) and on the other he was approaching Jaitley with the offer of helping finish off the chief minister politically, the Bihar deputy chief minister said. “We think the chief minister too must have got a whiff of these shenanigans. Moreover, after they together won the assembly polls in 2015 and RJD emerged as the largest party, Lalu and his cohorts never lost an opportunity to remind the JD(U) leader that he owed his position to them,” he said. Sushil Modi recalled how Lalu Prasad won the Patna University Students’ Union polls in the 1970s with the help of the ABVP, the students wing of the RSS. Modi, who was also associated with the ABVP, said after being elected the president of the union, Prasad visited the local RSS office to thank the Sangh. “Besides, in 1990 he became the chief minister only after he got a letter of support from our late leader Kailashpati Mishra. The assembly polls had then thrown up a hung house and without the support of 39 MLAs of our party, he would have never been what he became,” the BJP leader said. Sushil Modi said he had learnt about the meetings Prasad himself and his emissary had with Jaitley from many sources, including Sanjay Jha, a former BJP hand and now a confidante of Nitish Kumar. When reached for comments, Jha, a former MLC and now the JD(U) national general secretary, said Prasad had offered to pull down the grand alliance government “within 24 hours”. “With these episodes you can make sense of the hollow claims by Lalu’s family members that they are being victimized because they did not compromise with the BJP,” Modi said. These disclosures also deserve to be seen in the light of the many claims made by Prasad’s family in the recent past, the deputy chief minister said. Lalu Prasad’s wife Rabri Devi and Tejashwi Yadav had recently claimed that Nitish Kumar had grown uneasy with the BJP “within six months” of returning to the NDA in July, 2017, and had sent feelers through former poll strategist Prashant Kishor that he was game for a rapprochement with the RJD but they spurned the offer.